What On Earth Is Happening! 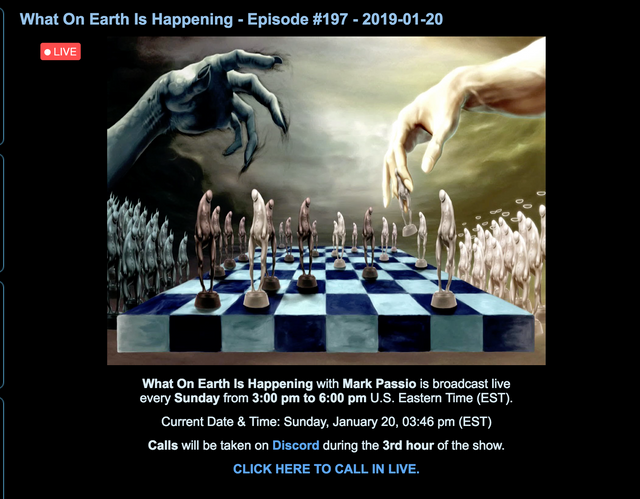 | Mark Passio Is Live Right Now!steemCreated with Sketch. Mark is doing "The Great Work". The motivation of his research, and the artifacts that are manifested as a result of it, is to communicate things people need to hear in order to know and control the self, which I believe is the point of life. Understanding of the self, or yourself, provides a realization that you are a spiritual being and you have the power to create a reality of peace and abundance for yourself, others, and the universe. I was fortunate enough to be a witness of his private lecture at Anarchapulco last year, can't wait to see him speak again this year!